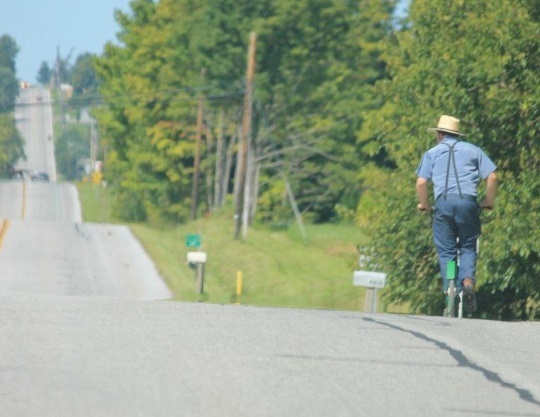 What do you know about the Amish of Geauga County, Ohio, the fourth-largest Amish community? Over 15,000 Amish live here. Yet the settlement kind of gets overlooked, especially with Holmes County so close. 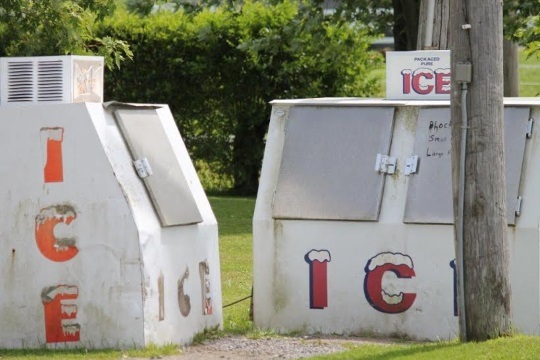 Among the buggies, windmills, and laundry lines of Geauga County, you’ll find something not often seen in other communities: the classic ice vending freezer. These ice machines are in about every street. They have fridges but no electricity, so they put their milk etc next to the ice to keep it cold. The ice machines are opened to everyone and the box next to it is for the money. 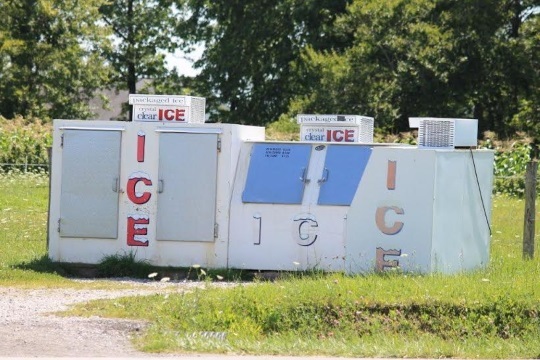 The photos today are from contributor ShipshewanaIndiana, who confirms the ice vending stations can be found throughout the settlement. These two look like they’ve seen many years of service. I spent three weeks in Geauga County in 2005. 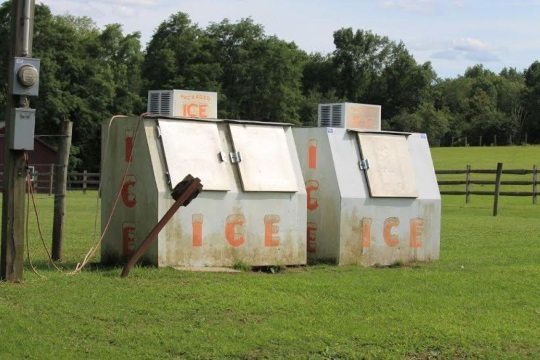 I don’t remember seeing these freezers (I have seen this in the Swiss Amish community of Allen County, Indiana). Maybe I wasn’t as observant as I should have been back then. I do remember seeing notes on the door for the ice delivery man, though. Ice prices. 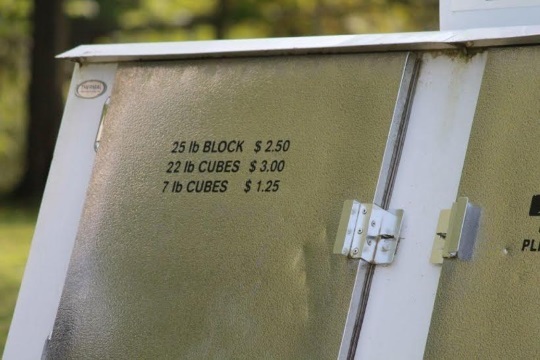 You can get a 25-pound block, or cubes. Note the helpful reminder: “ICE IS NOT FREE”. When I was growing up, we had an old-fashioned “ice box” — the kind that has a wood exterior. An ice man would drop off ice at a particular place in our area, and then everyone would go pick up the ice and bring it back in a buggy. We had a standing order. Having these machines everywhere must be more convenient than that arrangement. Along with the use of ice for cooling, you’ll also see other low technologies in Geauga County. 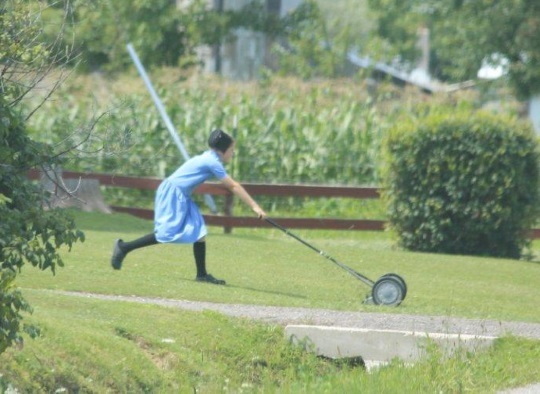 …and another is the reel push mower. We’ll have a lot more from the Geauga community in an upcoming post. 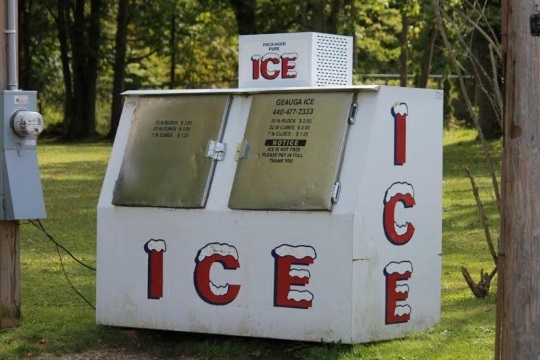 If for some reason you like to read about the Amish and ice, I’ll direct you to posts on an ice house in New York, harvesting ice in Wisconsin, and an ice kiosk in Indiana. I guess that can be a tidy little business for someone to operate. I wonder how many businesses operate as ice vendors in the county, and how many are operated by either the Amish themselves or by neighbors. Its interesting the culture of trust with these folks. As always, an interesting article about Amish adaptation. In Lancaster I’ve seen them in convenience stores, etc. filling their picnic ice chests with store-bought ice. FYI: The past three AA articles, I’ve received no e-mail notification of their posting. Only by checking the blog did I find there were new articles. It’s not a big issue; I often “jumped” the e-mail notification anyhow; but if this is a general problem others may be waiting. Thanks CS for the note, that’s good to know. Any chance they landed in spam or another folder? For whatever it’s worth I think they’ve been going out about an hour sooner the past few postings. I am shocked — SHOCKED, I say — that you could entertain a thought that AA could or would ever be relegated to a spam folder! Thanks; I was wondering what I’d do today. Now I have a hunt to conduct on my confuser! CS sometimes email systems make grievous errors like that… 🙂 I think if you check just today’s spam or Monday’s you should see the last two emails (if they’re in there and it’s not an issue on the notification system end). Anyway, let me know if I can help. It looks like the freezers are tapped in to electricity, owned by the village perhaps? Certainly that isn’t free, so who pays? Probably “Geauga Ice” or whichever company owns the freezers. I’ll ask my Ohio friend/pen pal (she lives in a suburb of Cleveland and often visits the Amish…has mentioned Geauga County many times) if she’s noticed this phenomenon. She’s planning a trip in a week or two. Sara, Im with you.. I dont see this as unusual at all. Every gas station & store anywhere I’ve lived have them all over the place. 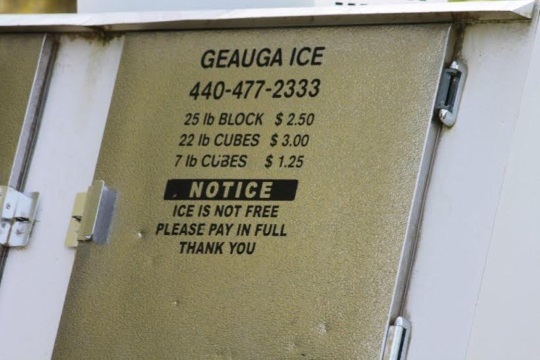 I live 30 minutes from Geauga Co & I dont ever remember seeing a huge amount of ice boxes anywhere.. but again, Im used to seeing them as a matter of course so maybe they just dont look out of place to me. 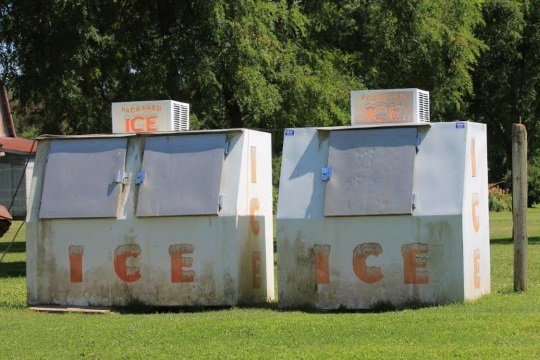 After reading this article the first time last fall, the next time went, I kept a look out for something unusual regarding ice boxes and didnt see anything unusual.. the block ice is a bit more unusual.. though I’ve seen them sold in South Texas too.. perhaps its a regional thing. 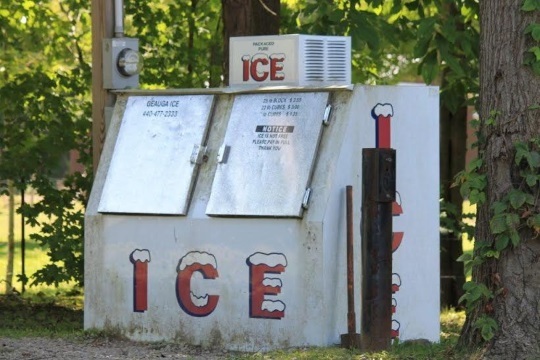 You can certainly find ice vending coolers at gas stations and the like, but I generally don’t think you see ice machines in rural Amish areas to the degree suggested in these photos and comments. I think one reason it caught our eye is that this is the largest Amish settlement which uses ice for cooling. The person quoted above who said there were “hundreds” of the machines “all over the place” spent about 4 weeks in the Geauga settlement visiting many of the homes in the community.